Margaretta D’Arcy, who is undergoing cancer treatment, was arrested at her Galway home yesterday morning after she refused to sign a bond to uphold the law and keep away from unauthorised zones at Shannon. Ms D’Arcy and Niall Farrell (60) of Oranmore, Co Galway, were given three-month suspended sentences by Judge Patrick Durcan at Ennis District Court last December for illegal incursion of the runway at Shannon Airport on October 7th, 2012. The sentence was activated for Ms D’Arcy when she declined to sign the bond. Her son Fin Arden told The Irish Times that he had spoken to his mother by phone after her arrest at 10am yesterday. “I spoke to her again by phone from Limerick, and she said she understood she was going to have to serve the full three months,” he said. Shannonwatch spokesman John Lannon said it was a “travesty of justice when the peace activists end up in prison, while there is no investigation of war criminals using the airport”. “While protesters at Shannon have been arrested before, and have been before the courts, all have been acquitted to date,” he pointed out. Ms D’Arcy, who was married to the late playwright John Arden, has been an activist since joining the anti-nuclear Committee of 100 led by Bertrand Russell in 1961. She was a member of the Greenham Common Women’s Peace Camp, and spent time in Northern Ireland’s H-block in the early 1980s. President Michael D Higgins referred to his close friendship with the couple when he spoke at Arden’s funeral at Mount Jerome crematorium in April, 2012. Mr Farrell, spokesman for the Galway Alliance Against War, said that discontinued use of Shannon by the US military was part of the programme for government, and Ms D’Arcy’s arrest for trying to highlight the issue was an “absolute scandal”. He called on Mr Higgins to visit Ms D’Arcy in prison. Ms D’Arcy and Mr Farrell are both due at Ennis District Court next Wednesday following a separate arrest at Shannon on September 1st, 2013. 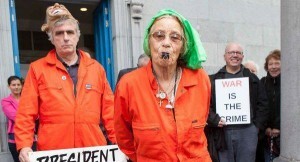 Irish writer and “Guerrilla Theatre Activist” Margaretta D’Arcy, 79, and co-defendant Niall Farrell, 60, both members of Galway Alliance Against War (GAAW) were pronounced guilty and sentenced on December 11 to three months in jail, suspended for two years, for their peaceful die-in on the runway of Ireland’s Shannon Airport on October 7, 2012. The die-in was part of an international week of actions against drone warfare, and also marked the 11th anniversary of the U.S. “war on terror”. They also face trial on a similar charge after another arrest at Shannon last September 1. On September 1, D’Arcy and Farrell were apprehended as they approached the same runway to protest Irish complicity as the United States prepared to attack Syria, and were held overnight. Two Shannonwatch plane spotters were arrested the same day outside the base and had their car and equipment seized for several days, but they were not charged. Ireland’s formal status as a neutral country continues to be undermined by the regular shipment of more than 2.5 million U.S./NATO troops, substantial armaments and occasional victims of “rendition” kidnappings through the international airport at Shannon. Shannonwatch monitors this violation of the Hague Convention and has protested successive Irish governments that have accepted the air traffic since October, 2001. Several formal appeals have been made to airport police to search suspect aircraft for illicit troop and arms shipments, to no avail. A U.S. troop transport aircraft was damaged in December, 2011 as it sat at Shannon Airport, but no one has been charged in the incident. Six months later, police searched Niall Farrell’s home and took three of his family’s computers, returning only two of them months later. When he and D’Arcy were arrested at Shannon in October 2012, they were questioned for 6 hours and released without charges. The next month they were arrested at their homes, interrogated again for six hours, and again released without charges. Another GAAW activist was taken in for a day of questioning in the interim, but he refused to cooperate except to ask why the Garda (police) would not investigate the violations of international law at Shannon. D’Arcy and Ferrell were eventually indicted for interfering with the proper use of an airport. Irish democracy has been subverted in the interests of this American war machine: the Greens and Labour entered government with a mandate to oppose Ireland’s role in these wars and develop a policy of neutrality, but reneged on their promises. Therefore, we feel we have no alternative but to block the runway at Shannon to highlight Irish involvement in this carnage. This time, the two were held overnight and taken to court the next day. Farrell was repeatedly admonished not to make political statements, and when Judge O’Kelly tried to silence D’Arcy’s “political” comments, she shot back, “How can you try to depoliticize a political action?” Both were eventually released on bail after promising not to trespass at Shannon until the completion of the case. They returned to Judge Durcan’s court the next week, on September 11, again dressed in orange jumpsuits and Farrell at times donning an Obama mask. Farrell told the court they had committed no offense, but had acted to spotlight crimes against humanity. He was ordered to sit down and remain silent. When he persisted, he was ordered from the room. “You can remove me from the court but you can’t remove the blood that stains Shannon Airport and the hands of the Irish people,” he stated boldly as he was led away. The court heard her out and then adjourned. At their trial on December 2, the judge allowed the summons to be hastily amended to correct the citation error D’Arcy had tried to point out earlier, and which would commonly be grounds for dismissal. Farrell was denied a request for recess to consult a lawyer on the matter. This prevented the defendants, representing themselves, from preparing a suitable defense. The judge also stopped any questions or witness testimony related to the Irish Constitution and Irish treaty obligations as a neutral nation. After their sentence was announced on December 11, D’Arcy stood to make a citizen’s arrest of Judge Durcan, “for making Irish people active allies and participants in illegal wars…” she read from her indictment. The statement was pulled from her hand by police as the judge slipped out of the courtroom. For more information, visit shannonwatch.org.